The Ennis Branch of Conradh na Gaeilge was established in November 1913. However, it is not the the oldest branch in the county, as Conradh was active earlier in West Clare, particularly in Miltown Malbay. Through the years the Ennis branch was active in promoting the use of Irish in the lives of the people of the town. In the Fifties, it organized "Feis na hInse", a festival of music and language, singing and dancing, in Ennis. The Feis lasted for several years until it fell into decline in the sixties. Then, In 1980, people with an interest in promoting Irish were invited to a meeting in the Queen's Hotel, Ennis. Tadhg Mac Conmara, an elected member of Clare County Council, was Chairman of the meeting and that night, the Ennis Branch of Conradh na Gaeilge was re-established. 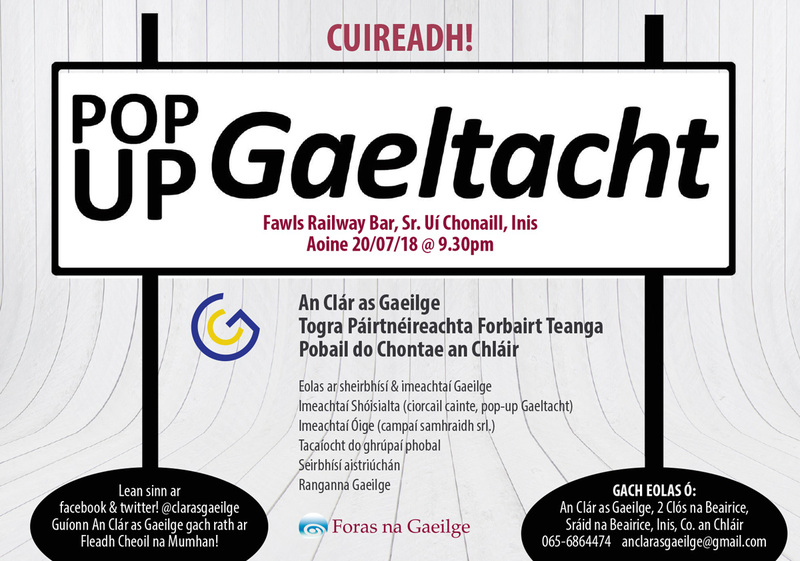 The new branch was registered with the Head Office of Conradh na Gaeilge and it began to plan a re-awakening of the Irish language in Ennis and throughout the County. In 1982, Irisleabhar na Gaeidhlge, the first Journal in Irish, celebrated the centenary of it’s first edition. Michael Cusack, a Clareman and founder of the Gaelic Athletic Association, was editor of the Journal. The Ennis branch of Conradh decided to have a commemoration organized in Ennis and in Carron, where Cusack was born, to celebrate the establishment of the magazine in 1882. President of Ireland, Dr. Patrick Hillery unveiled a plaque on the gable of the schoolhouse in Carron, where Cusack taught, and Cardinal. Tomás Ó Fiach was the chief celebrant of a special Mass in Ennis Cathedral. Speaking at the anniversary, the President said that people of Clare should establish a permanent institution to be ensure that the Irish in the County would not disappear. 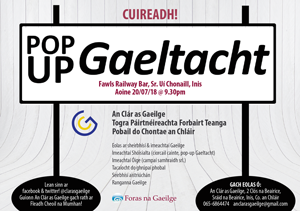 In response to the challenge of President Hillery, Conradh na Gaeilge Inis decided to set up a Gaelscoil-LánGhaeilge and, in so doing honour, the legacy of Michael Cusack. Gaelscoil Mhíchíl Cíosóg opened its doors in September 1983 after a recruitment campaign by a group of parents that wanted to provide Irish-medium education for their children. The Ennis Branch registered in the Glór na nGael Competition for the first time in in 1981. This was a competition set up By Cumann na Sagart to identify the best community in the country in promoting Irish. Due to the Gaelscoil establishment in 1983, Ennis won the National Award for the first time. President Hillery returned to Ennis to present the prize at a public ceremony in the town. As part of the celebrations to mark the winning of the Glór na nGael Award in 1983, an Irish festival called "Féíle na hInse" was initiated. Its original aim was to promote spoken Irish and all the local schools were invited to participate. The first Féile lasted four hours on a Saturday afternoon. Over the years it has grown and grown and is now the largest Festival of it’s kind in the region and is held over nine days.